Maybe you've noticed: Since the beginning of September, there's been an abundance of quality, homegrown theater productions around the city, from both new or returning companies as well as from the usual suspects. Brand New Sheriff ignited the upswell with Jitney, the best drama of the year, and the drive continued with scintillating efforts from Donna Scott Productions, OnQ Performing Arts and The Playworks Group. And that was just the first three weeks. Within the next two weeks, Actor's Theatre unveiled a fiery American Idiot, PaperHouse Theatre trailblazed at the Goodyear Arts Center with The Revolutionists, and Children's Theatre of Charlotte outdid itself at ImaginOn with a high-flying Mary Poppins. 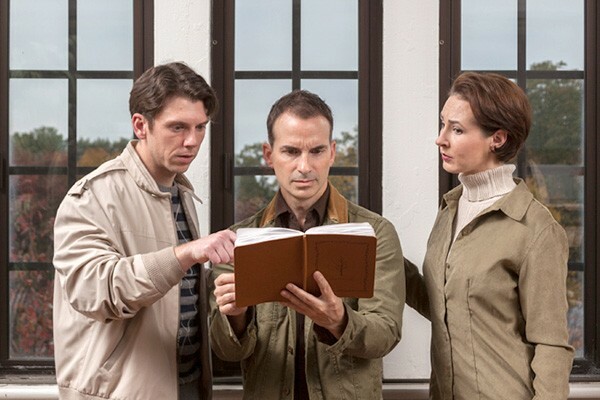 Three Bone Theatre has sustained the seasonal glow with Fahrenheit 451 and the Actor's Theatre encore Hand to God was better than the Broadway production. You have several more chances to experience excellence in local theaters before the winter solstice, including reprises of holidy faves by Chickspeare, OnQ, Children's Theatre and Actor's Theatre. But if you're itching to get a taste of the grassroots fervor that has gripped the Queen City throughout the fall theater season — and escape the oncoming blizzard of Christmas repeats — your only choice is to check out Charlotte's Off-Broadway. 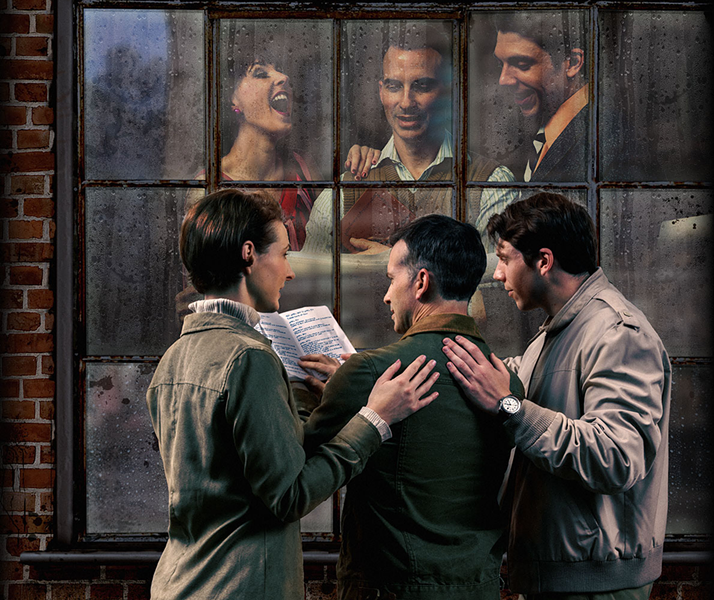 Gestating at the Warehouse PAC up in Cornelius for the past five years in storefront productions, Charlotte's Off-Broadway is staging an Uptown rebirth with the Metrolina premiere of Richard Greenberg's Three Days of Rain. For founding producer Anne Lambert and her company, it's their first presentation at Spirit Square since 2005 — and their first Actors' Equity production ever. 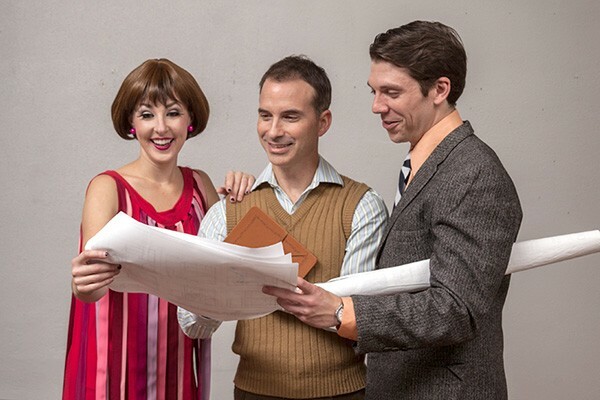 Lambert isn't coy about what she hopes will begin sprouting from all the recent professional grassroots action around Charlotte this season — a professional company with the same regional status and prestige that Charlotte Repertory Theatre had before it folded in 2005. "Yes," says Lambert, "I do see Three Days of Rain as a project that represents the beginning of a concerted effort to lift Charlotte's Off-Broadway to a new level, to impact the city's theater scene and, yes, to move Charlotte closer to re-establishing ourselves as a logical home for a LORT (League of Regional Theatres) company." It begins by consistently producing high-quality shows that the community will continue to come out and see — and continue to hit their wallets and support. Butts and bucks. Part of the push on Lambert's side is signing Equity contracts with her actors so that they are all treated and paid according to union standards. Two of the three Equity players, Caroline Bower and Brian Lafontaine, are longtime Charlotte favorites. Lafontaine is also co-producing. He and Lambert last collaborated in 2003 when he acted in The Hotel Project, a pair of one-acts produced by Lambert and Matt Olin while they were, respectively, director of development and managing director at Charlotte Rep during its sunset years. More recently, Lambert and Lafontaine have been attending Creative Mornings, a monthly happening for Charlotte creatives organized by Olin and Tim Miner. The old mojo began to work again during the supercharged meet-ups. Three Days of Rain was among the scripts that Lafontaine had brought with him from New York when he moved back to Charlotte. He was at a point in his career where he was thinking about producing a show that he wanted to do — at a professional level. "Anne had told me if I ever wanted to get a show produced, she could get it done for me after we had worked together on The Hotel Project," Lafontaine remembers. "I know how passionate she is, and how capable she is. She loves theater. She loves actors, and she loves contributing in any way that she can to the artistic community in Charlotte. She's an incredible partner. There's no way this would be happening without her." There was a notorious Broadway run of Three Days of Rain back in 2006 starring Julia Roberts, so Lambert had heard of the script when Lafontaine brought it to her. But she hadn't read it. Months of discussions culminated in opting for the Greenberg play. "It's a well-written, Pulitzer Prize-nominated script," Lambert stresses. "It's sophisticated, it's funny, it's compelling and it's mysterious, full of Easter Eggs that reward the attentive audience member. It has six completely beguiling characters. I'm excited by the device of the dual roles, where the actors we see portraying Walker, Nan and Pip in Act 1 turn around in Act 2 and play their parents. These three talented actors in our show are so adept, so good at what they're doing, they really are two different characters for me." Notwithstanding all that Roberts hoopla, Walker and Ned, the son and father Lafontaine will play, have always been the core characters at the heart of Three Days. Both are startlingly eccentric and brilliant. After his dad's funeral, Walker had vanished so completely that his sister Nan, the sensible branch of the Janeway family, had given him up for dead while he was holed up in Italy for a year. The siblings now meet at an unoccupied loft where, 35 years earlier, Walker's dad had designed his masterwork, Janeway House. But wait a second. When they finally read Daddy's will, the sibs discover that, instead of going to them, the Janeway House has been inherited by their longtime friend Pip, the son of Theo Wexler, who was Ned's partner at their architectural firm. It's a mystery. To get to the bottom of it, Walker obsessively pores through his dad's terse diary, which he discovered soon after he returned to the loft. Friction, mystery and brilliant minds are all in the mix. "The dialogue is fantastic," Lafontaine enthuses. "It has an almost Aaron Sorkin feel to it. Sure, I think it's funny in a lot of places. Thank God. Otherwise, I think we'd be driving audience members to therapy after. And the mystery adds another interesting element to the play. But for me, it really is more of [a dramatic] study about the relationship between children and parents." Bower, who plays Nan and her mom Lina, burst onto the Charlotte scene in 2007 with starring roles in Thoroughly Modern Millie and The Wizard of Oz. By the time she dropped out in 2014, Bower had drawn acting paychecks from every company in town that cuts them — Actor's, Children's and CPCC Summer Theatre. She became the most persuasive poster child we had for the notion that stage acting could be a viable profession in Charlotte. Then she took a position as teacher and director at Providence Day School to expand the theater program there and carry herself from car payment to car payment. She came out of "hiding" this past summer, choreographing Cry Baby at Theatre Charlotte, and now she is acting under her second Actor's Equity Association contract within the space of two months. "I am so lucky to have been a part of The Revolutionists and Three Days of Rain. Being a part of two projects that care enough about their actors to jump through the AEA hoops is humbling. Not only do the production teams care about their actors, but both of these scripts are the best of the best." Paige Johnston Thomas, who directs, brings an additional chunk of Charlotte Rep DNA to the Lambert-Lafontaine production team. Her first acting gig in the Queen City was in another three-person cast, playing C in Rep's 1995 production of Edward Albee's Three Tall Women. Thomas's most recent paying gigs in theater have been her directing at Theatre Charlotte and Davidson Community Players. But her most important role on the local scene is as an "anti-relocation advocate," having founded C&J Casting with Mitzi Corrigan to help local theater pros get steady work in commercials and film. Thomas saw Bower's outing at Goodyear Arts, where she portrayed a vain, charismatic, and bubble-headed Marie Antoinette. "I texted her this after the show: 'I couldn't keep my eyes off you,'" Thomas relates. "Which in real life sounds kinda creepy, but in the acting world, it's a huge compliment. She has an innocence that is constantly being belied by her quick intellect and emotional depth. It makes for great conflict, which makes great drama." Head for Duke Energy Theatre if you want to see it. Then consider hitting your hip if you like what you've seen.